Vancouver Island is oft-overlooked by visitors to British Columbia, but you’d be remiss to skip the incredible untarnished scenery and fresh, flavourful food harvested from the surrounding ocean and one of the largest stretches of temperate old growth rainforest left on the planet. The rich canopy and undergrowth pres right up to the beach, where the sand is packed tightly enough to go for a run or bike ride. Explore the beach at low tide to find all sorts of critters, from mussels and barnacles clinging to the rocks, to clams burrowed in the sand and anemone and tiny fish swimming in the tide pools. It’s a brief 25-minute plane ride from Vancouver to Victoria, or an hour to Tofino, and there’s also an option to travel from Vancouver to Victoria by ferry. 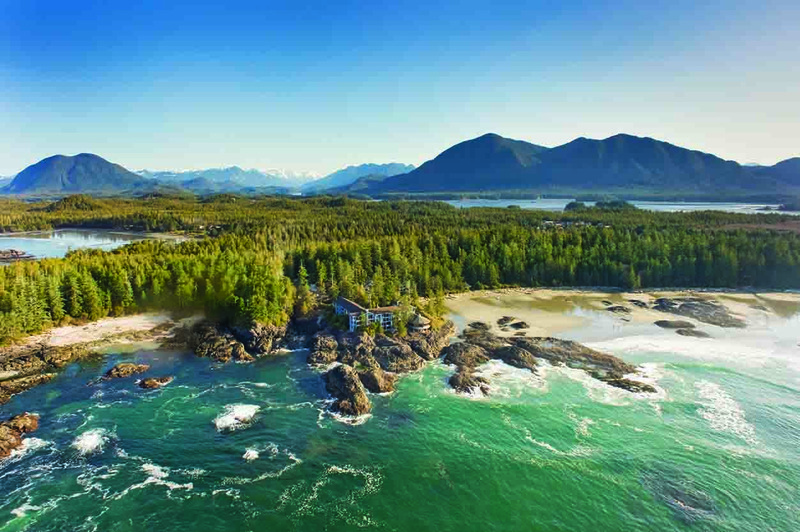 From the island’s capital of Victoria to the renowned surf town of Tofino, the pure natural landscape is this secluded island’s biggest draw. Whether it’s long walks along the beach, racing after the ocean swells on a surfboard or winter storm watching with a cup of tea nestled by the fireplace, there is something for every type of traveller to enjoy. The fresh, crisp air and bounty of nature will rejuvenate even the most sluggish city dwellers here on the Pacific Rim. detoxifying By the Sea massage incorporates local seaweed into a relaxing customised massage. The in-suite bath menu is another unique amenity. Choose from Pacific seaweed, lavender bubbles or an acai mineral treatment soak to be drawn in the spa-like bathtub at any time during your stay. There’s no beter way to melt away worries and unwind while listening to the waves crashing against the shore. Each weekend there are even complimentary yoga and water aerobics classes for guests. The first true five-star resort in Victoria, Oak Bay Beach Hotel was originally built in 1927 and served as a popular waterfront retreat for locals for many decades. However, it wasn’t until the hotel reopened in 2012 that international clientele began flocking. Oak Bay Beach still retains its signature English manor style, with 95 per cent of the old building – like the copper hood over the lobby fireplace – recycled or reused in the six-year reconstruction. Additions like HDTV, Wi-Fi and heated tile floors in the spacious bathrooms bring the hotel into the21st century. At the adjacent Boathouse Spa & Baths, allow at least an hour to enjoy the three heated outdoor mineral pools and eucalyptus steam room prior to a treatment. Victoria’s only oceanfront spa features an array of nail and skincare services as well as unique body treatments and massages. Just a few kilometres south of Tofino, this rustic resort includes 41 guest rooms in the main lodge along with 20 cottages, perfect for larger parties or couples who require more privacy. Rooms here are warm and inviting, with Douglas fir furniture and just a few simple decorative touches – like a framed grey wolf print and underwater whale-watching art prints. The Judith Jackson toiletries are divine – the invigorating citresse shampoo and juniper, basil and sage shower gel each have aromatherapy benefits, as do the soothing bergamot bath salts. 2016 marks this Relais & Chateaux property’s 20th anniversary and there’s a reason it has won so many accolades over the years. With high ceilings and a rustically organic design, the Wick exudes an effortless elegance that can only be achieved by embracing nature. Take the bathrooms for example. Heated slate floors lead to a bathtub with the most magnificent ocean views, and a propane fireplace warms the room with a gentle glow on chilly evenings. Service is friendly, without an ounce of judgement or pretension, and every need is anticipated. Rain jackets and umbrellas are thoughtfully waiting in the closet should the weather takes a tempestuous turn, and the front desk will even provide galoshes upon request. 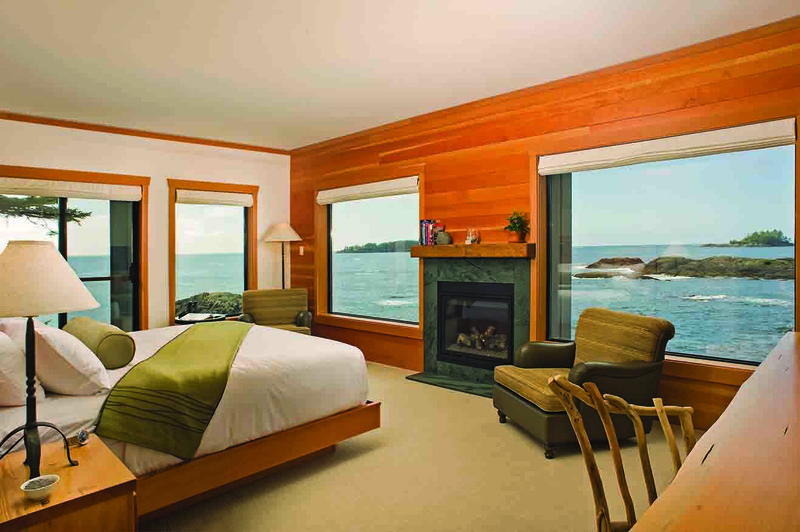 The 75 rooms are split into two lodge buildings overlooking Chesterman Beach, the most social beach on the island. There are all kinds of nooks and crannies to explore on property, from a secret cove overlooking the Pacific Ocean to the 450sqft Henry Nolla Gallery featuring life size cast glass salmon sculptures, acrylic landscape paintings and driftwood furniture by local Vancouver Island artists, all available for purchase. The gallery is named in honour of a local woodworker who did all of the adze woodwork found in beams throughout the resort, as well as the cedar welcome doors and fireplace mantles in every guest room. The esoteric adze technique, producing a scaly textured pattern, is a signature feature here among so many other wooden lodges. Wander along the beach to the nearby carving shed and you may find local woodworkers ‘Feather’ George Yearsley or Christen Dokk Smith crafting new sculptures. Both are happy to chat with guests and this informal artist residency is just one more aspect of the Wick’s unexpected charm to discover. 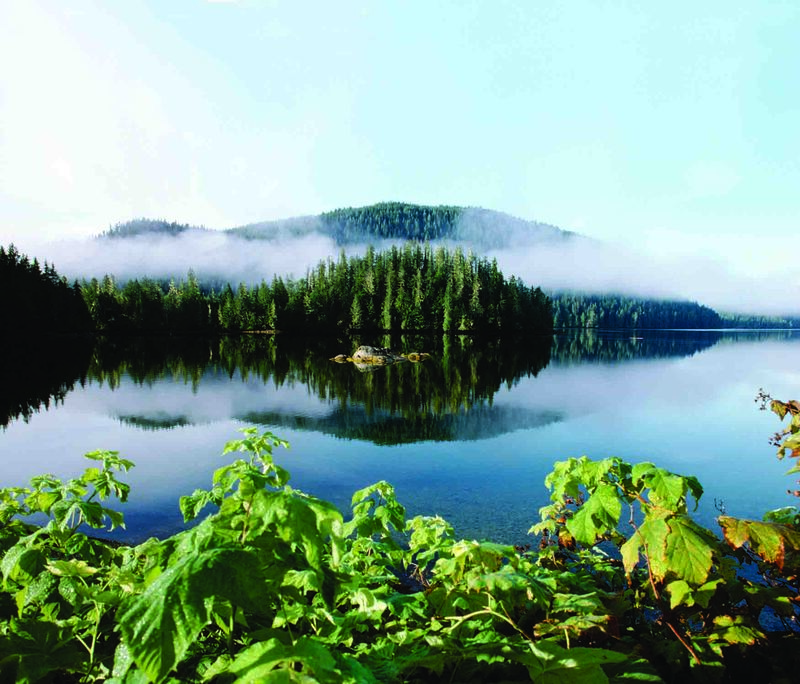 To learn more about the surrounding environment, Long Beach Nature Tours leads private storm watching walks, nature hikes and intertidal zone beach expeditions and can even take you to the Clayoquot Sound UNESCO biosphere reserve. 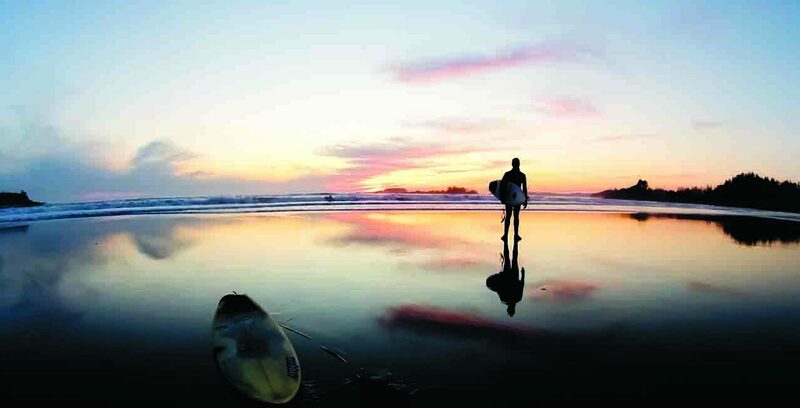 The resort’s Pointe Restaurant boasts 240-degree panoramic views of the ocean along with some of the best food in Tofino. Executive Chef Warren Barr’s menu revolves around the freshest ingredients foraged from the surrounding rainforest and ocean, including hemlock, blackberries, seaweed and local fish. The weekly tasting menu is the best way to experience this highly seasonal,ingredient-driven Canadian cuisine. The meal might begin with smoked mussels wrapped in nasturtium leaves, followed by tender sweetbread nuggets coated in leek ash and vibrant sockeye salmon hidden under thin slices of horseradish-flavoured turnips. For a more casual evening, Driftwood Café, with its driftwood bar centrepiece, is a great option to unwind with wine, cheese and small share plates while curled up on the couches beside the fireplace. 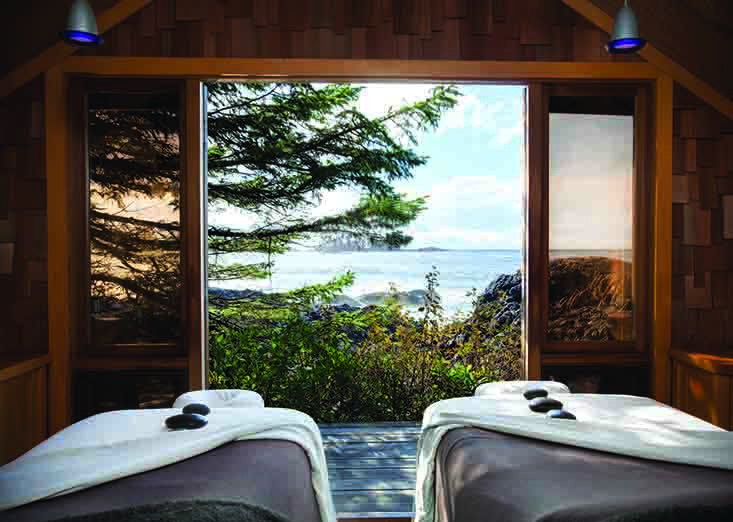 The resort’s Ancient Cedars Spa is the premier spa in Tofino, and bookings should be made in advance. Daily morning yoga classes are limited to just five yogis, held in a loft adjacent to the spa. upwards to cobra pose. After waking the body up with yoga practice, head downstairs for a full spa experience. Perhaps pop into the co-ed eucalyptus steam room for a few minutes before waiting outside on a wooden lounger facing the ocean sipping an herbal tea blend from Teafarm. A friendly therapist will greet you with a warm foot soak before offering a blissful massage, body scrub or facial. The organic sea facial utilises hand-harvested seaweed products from Seaflora in British Columbia and every treatment can be customised for your skin type. The restaurant has been open for less than two years, but Chef Nick Nutting’s cuisine is drawing international guests. Nutting worked at the Pointe Restaurant at Wickaninnish Inn for five years before opening his own restaurant to critical acclaim. The first floor den is open for lunch, but to try everything on the menu, come for dinner. Dokk Smith from the Wick Inn’s carving shed created a forest landscape displayed above the second-floor patio along with custom taps for the bar’s draft beers. Just another example of how intertwined the community is and how supportive artists and entrepreneurs are of one another. The food here is uniformly delicious, as much a testament to Nutting’s talent and creativity with local ingredients as the technically perfect execution of a passionate kitchen team. A seaweed salad seems apropos after a walk on the beach, and the potato-crusted oyster is a crunchy, juicy signature bite, dressed with truffle oil and brightened by a bed of gren apple slivers. 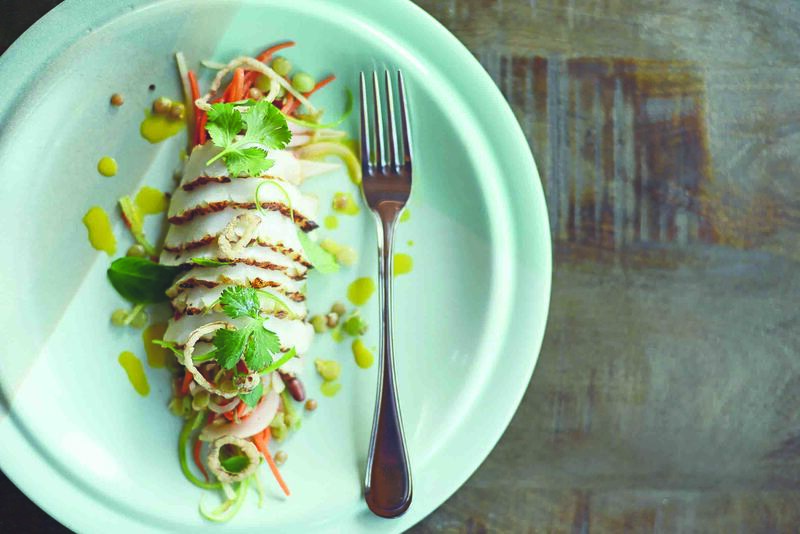 Marvel at how carefully the Humboldt squid is tenderised before a quick char and enjoy the citrusy, Asianinfluenced presentation over jicama with finishing touches of basil, cilantro and fried garlic chips. Enormous plates, like the Block Party barbecue platter or steelhead trout with root vegetables and puffed rice are ideal for larger groups.